don't be a coconut: Arctic Monkeys: Are They Worth All the Hype? 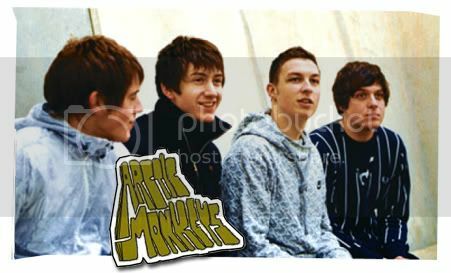 Arctic Monkeys: Are They Worth All the Hype? What with all the hype surrounding Arctic Monkeys due to the release of their second album, Favorite Worst Nightmare, I’ve got to check out what they’re all about. Yeah, so I’ve only recently discovered them, so what? The first song that I’ve only heard from Arctic Monkeys is called ‘Dancing Shoes’. The song is decent…enough. And I’m always confused between Arctic Monkeys and Arcade Fire, only because both of them start with A. Recently, I saw their latest video ‘Brianstorm’ on MTV, thought it was cool because you don’t get to see the full view of the band. The song didn’t get me the first time, but after a couple of listens, turned out to be cool as well. So, overall, I thought that the Arctic Monkeys were just the coolest! But, that was before I realized that the lead, Alex Turner and I, shared the same age; the coolness factor just dropped a notch. If he was like 27 or at least 26, they would’ve still remained cool to me. There’s nothing mysterious about guys with the same age; you know the reasons to WHY they do WHAT they do. Because they’re going through a rebellious phase, that’s why! 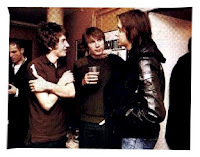 Speaking of The Strokes, they’re fond of the Arctic Monkeys, check out this picture, and check out this video. And the Arctic Monkeys are undeniably fond of The Strokes, if you don’t believe me, watch this video. The Arctic Monkeys even made a cover version of the Strokes’ song ‘Take It or Leave It", not too shabby. The videos I’ve posted are ‘A Certain Romance’ and ‘Leave before the Lights Come On’. I like one of the lines in ‘A Certain Romance’ where it says, “There’s only music, so that there’s new ringtones…” Haven’t you ever noticed how if there’s a new song on the radio, that song instantly becomes everyone’s ringtone. I mean, what’s that all about? You know, there’s only like a million and one other songs to choose from out there, besides the only ones you hear on the radio.